The mission of Mason's Special Education program is to improve the lives, productivity, and education of persons with disabilities. A variety of options are available at Mason for students to learn more about working with individuals with disabilities. Coursework is available for both undergraduates and graduates in teacher licensure areas as well as non-teacher licensure fields that prepare professionals working with individuals across the lifespan. The programs provide professionals with the specialized knowledge, skills, and dispositions needed to support individuals with special needs. 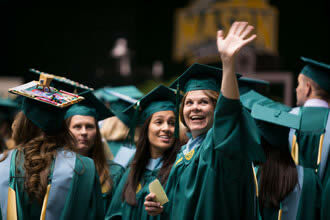 George Mason University has some of the nation’s top online programs as evaluated by U.S. News & World Report in its just-released 2019 rankings, with several programs making significant gains over last year. * Includes coursework that leads to teacher licensure. Contact Division for details on licensure requirements.